It had been too easy. They captured Jesus without a fight. They rushed him through their kangaroo court and had him quickly condemned by the Romans. Oh, sure, they had to manipulate Pilate a bit. Manipulating the crowds was even easier-- the same mob that shouted and worshiped him scarcely a week before had now cried, "Crucify him!" It had all been so easy. And now they were there to enjoy their day of victory. So these leaders of the Jewish people-- priests, scribes and elders-- were there at the cross to watch this Jesus of Nazareth die. Their hearts were filled with no remorse and no guilt. They had nothing but bitter hatred and contempt for this man who had made their lives so miserable for the last three years. Now these important men who had used their important positions to mask their evil deeds gloated in their victory. 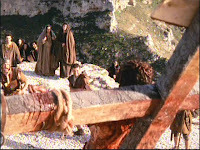 And they shouted insults at the man who suffered on the cross. "Having a great time poking fun" at a tortured and dying man? .Not of one of them saw the horror of their deed. Not one of them noticed as the lips of the dying moved in prayer, “Father, forgive them; they don’t know what they are doing” (Luke 23:34). And not one of them knew how right they were! To save others, he could not save Himself! And so He died. And the gates of hell were torn off their hinges!